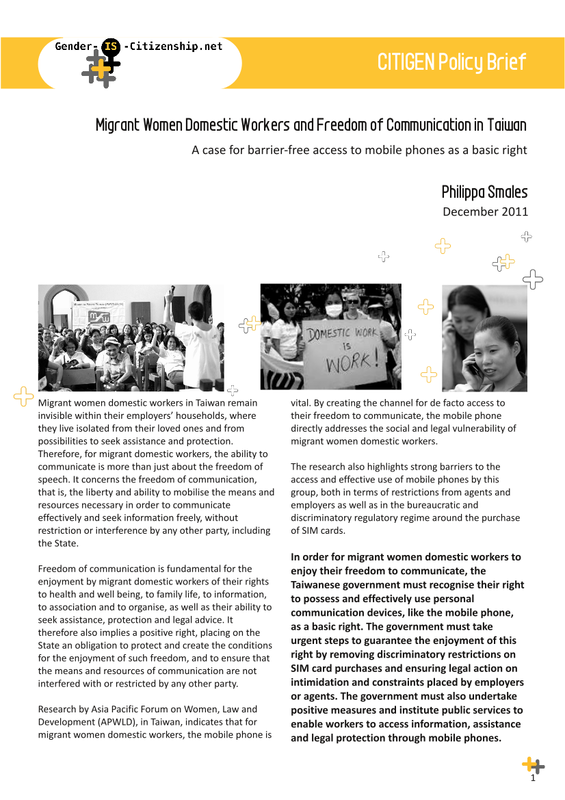 Based on the research carried out by APWLD under the aegis of CITIGEN, Philippa Smales showcases that for the vulnerable social group of migrant women domestic workers in Taiwan, the mobile phone is a vital tool to garner information, communicate and organise. By creating the channel for de facto access to their freedom to communicate, the mobile phone directly addresses the social and legal vulnerability of migrant women domestic workers. This policy brief highlights the social and regulatory practices that impede access to mobile phones and provides relevant policy recommendations. 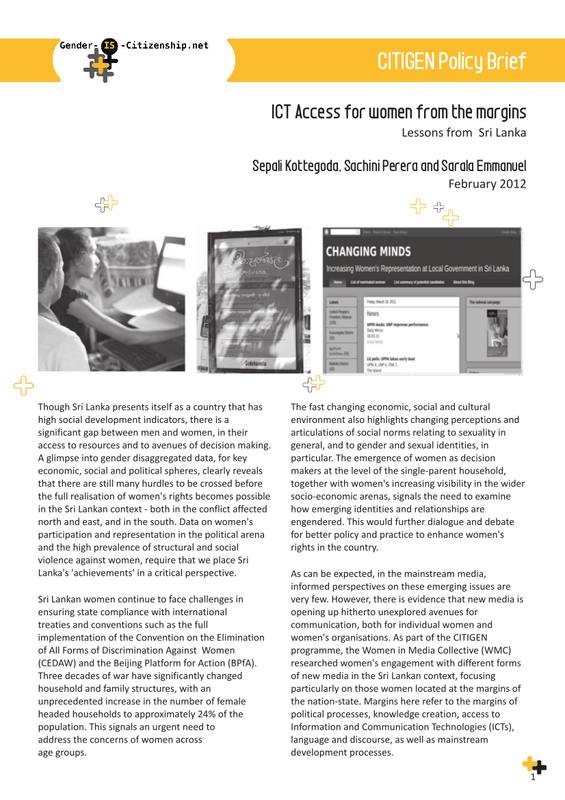 As part of the CITIGEN programme, the Women in Media Collective (WMC) researched women's engagement with different forms of new media in the Sri Lankan context, focusing particularly on those women located at the margins of the nation-state. The findings from the research, especially those that provide insights on the impact of state ICT policies on women's engagement with new media, are discussed briefly in this document. Along with this, a few policy recommendations are listed in this document. Read Sri Lanka's policy brief here. 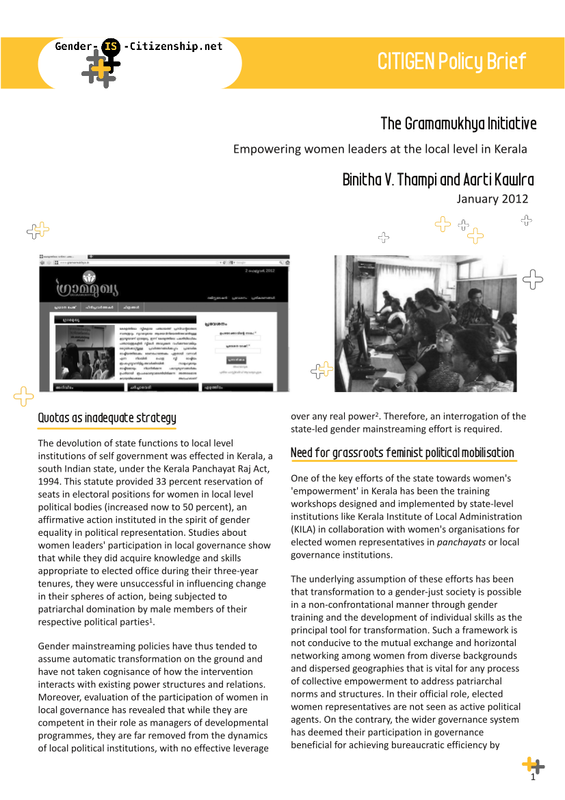 It was felt that the networking of women leaders in local governance through a digital platform would provide an innovative point of departure for catalysing a sense of solidarity among themselves and a connection to the women's movement in Kerala. The potential of Information and Communication Technologies was thus sought to be harnessed to provide alternative spaces for the articulation of women's voices. Read India's policy brief here. It explored the dynamics of the multiple counter-publics and alternative public spheres in Hong Kong and Guangzhou, two distinctive Chinese societies under the regimes of post-colonialism and authoritarianism, respectively. The research study looked at the uses of new media among women's organisations and activists for community building and campaigns for social justice. 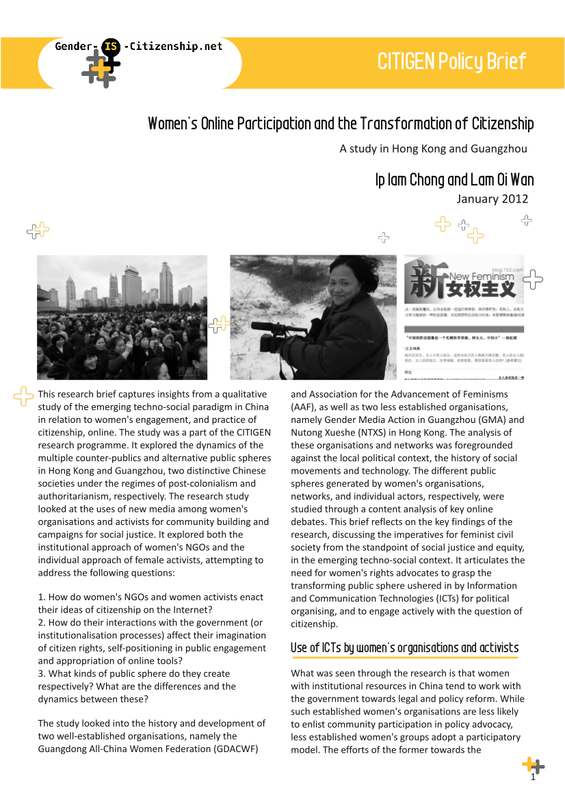 The policy brief also makes several policy recommendations for how feminist intervention in citizen movements can be revitalised in China and how digital spaces will need to be imagined and deployed. Read China's policy brief here. 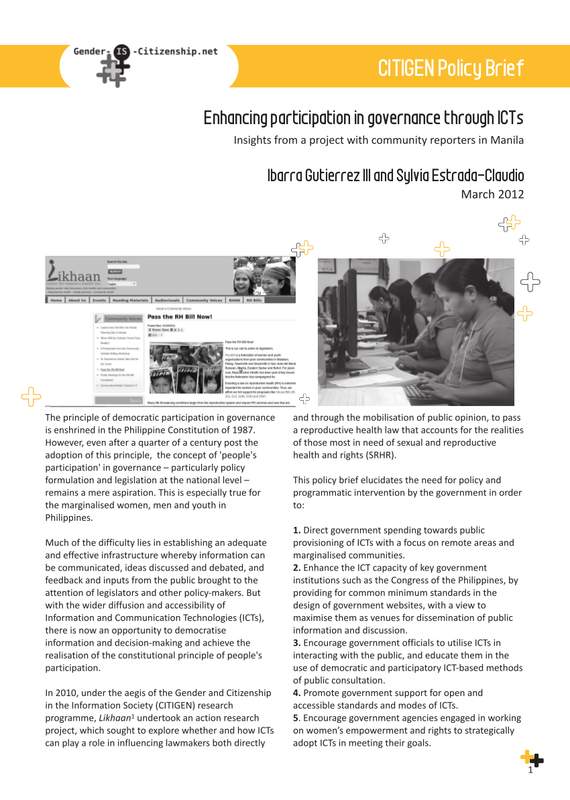 Under the aegis of the Gender and Citizenship in the Information Society (CITIGEN) research programme, Likhaan undertook an action research project, which sought to explore whether and how ICTs can play a role in influencing lawmakers both directly and through the mobilisation of public opinion, to pass a reproductive health law that accounts for the realities of those most in need of sexual and reproductive health and rights (SRHR).